Nokia is trying to reclaim its place in the smartphone business after selling its mobile division to Microsoft. Although, the company has not revealed its plan to foray in the market yet, but the latest report drops ample hints about it. 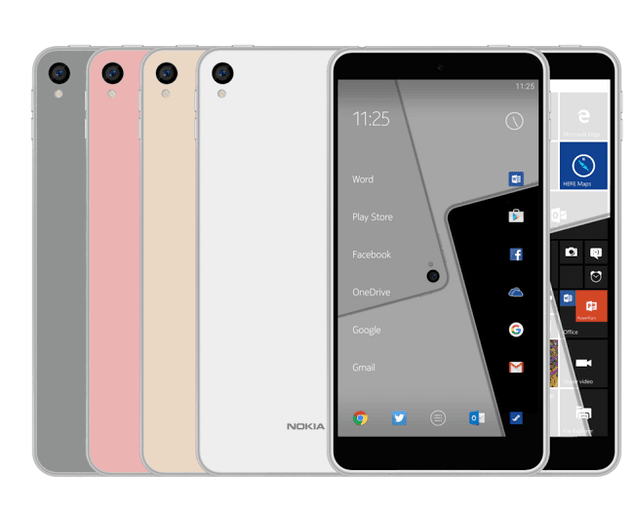 A website has leaked some information about Nokia’s forthcoming smartphone, dubbed as C1. There are a few rendered images of the smartphone as well. Going by the images, the C1 looks like a candy bar phone with a resemblance to the Apple iPhone 6S. Thankfully, it has fewer bezels than its inspiration. Interestingly, the rendered images also show the phone running on both the OS, Android and Windows Phone. Such reports should be taken with a pinch of salt. It would be interesting to see if Nokia indeed has plans to launch such a device with two OS options. We have to wait till next year to have clarity regarding Nokia’s second inning plans. I miss Symbian actually. Nokia should revive Symbian for their low end phones. I have recently bought New Nokia 808 pureview for Rs.12800 from ebay.in with 1 year manufacturer (indirect) warranty on mobile. I should contact the seller, then he will issue the service slip. Then I can show the service slip to any Microsoft service centre in India to claim warranty. Believe or not . nokia was a legand and still top . Using Asha 501 still pretty than todays androids interms build quality… Getting bore with android nowadays . Using Asha 501 .. Is any 1 forgot about N series?? That phones was a Tremendous , brilliant .. N70, 6600 still remembered abt it. Ah. I hate JAVA phones regardless of the company because there is no multitasking for all apps except FM radio and music player. Go to ebay.in and search. Now also you will get new mobile handset of N8 and 808 (with seller warranty, not manufacturer warranty). Yep Sudhakar I am too missing Symbian OS and Nokia! Waiting for Nokia to launch in Symbian, Android and Windows. Read my comment properly. If it was not extinct, I would have mentioned ‘nokia should continue….’ .